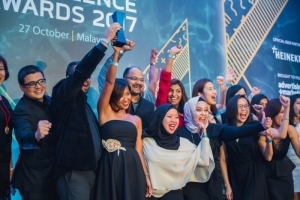 Unilever Malaysia blitzed the competition and bagged the highest honor of the night — ‘Marketer of the Year’ — in front of 400 audience members, at Advertising + Marketing‘s fifth annual Marketing Excellence Awards 2017. Helping Unilever Malaysia gain momentum, were the numerous campaigns for brands including Lipton, Wall’s, Sunsilk and Breeze. With a total prize pool of three Golds, two Silvers and three Bronzes, Unilever Malaysia won big in the categories of Excellence in Brand Strategy, Excellence in Out-Of-Home Advertising and Excellence in Consumer Insights/Market Research. Continuing to demonstrate its marketing might, Unilever Malaysia also finished second in Excellence in Corporate Social Responsibility and Excellence in Marketing to a Female Audience. Finishing off its impressive haul, the company took home Bronze in Excellence in Integrated Marketing (Consumer), Excellence in Media Strategy and Excellence in Sponsorship Activation. Coming in close at second was last year’s overall winner, Etika, which took home one Gold, six Silvers and one Bronze. Etika won the Gold in Excellence in TV/Video Advertising with its ‘Good Then. Good Now. Goodday.’ campaign that brought the ‘goodness of milk’ to life for the Goodday brand. Etika’s other winning campaigns were for brands such as Mountain Dew and Wonda. A total of 100 trophies were awarded to the top achievers at Aloft Kuala Lumpur Sentral. Click here to see this year’s full list of winners. First-time entrant, Fujiaire SHIBUI, also stood out with its ‘Simple Is Beautiful’ campaign, collecting three Golds for Excellence in Marketing Communications/Public Relations, Excellence in Integrated Marketing (B2B) and Excellence in Launch Marketing; and two Bronzes for Excellence in Brand Strategy and Excellence in Marketing Innovation. Star Media Group’s campaign ‘Predator In My Phone’ was also a big hit with the judges this year, grabbing three Golds in Excellence in Digital Marketing, Excellence in Viral Marketing and Excellence in Social Media Marketing. Not far behind was ‘NIVEA Men MYPadang: Getting Men Excited About Skincare Through Football’ campaign which won Beiersdorf Malaysia two Golds and one Bronze. Clarins Malaysia and Tune Talk similarly took home two Golds for their highly-rated marketing initiatives. High scoring brands this year also included Malaysia Airlines (one Gold, two Silvers, three Bronzes), Loob Holding (one Gold, three Silvers) and Mamee Double-Decker (one Gold, three Silvers). Quite a few other first-time entrants also received awards on the night including Bank Kerjasama Rakyat Malaysia, Tesco Stores Malaysia, Tourism Australia and Suruhanjaya Pengangkutan Awam Darat. Judged only by esteemed industry leaders and updated each year with new categories that cater to the modern marketers, Advertising + Marketing‘s Marketing Excellence Awards has become the undisputed platform for benchmarking brand marketing excellence in Malaysia. This year, the awards were judged by 22 senior marketers from leading brands including McDonald’s Restaurants, Tune Talk, Fonterra, Volvo Car and more. Following highly successful launches for the past four years, the Marketing Excellence Awards 2017 was bigger than ever, with a total of 499 entries received and over 65 brands shortlisted as finalists across 33 contestable categories. In the end, the best campaigns, initiatives and programmes came out on top and Advertising + Marketing extends their heartiest congratulations to all winners! You can order additional trophies for your company here. The Marketing Excellence Awards 2017 was sponsored by Grab and Mediaspokes and supported by partner, Heineken Malaysia.